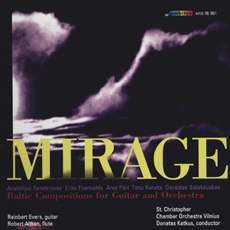 This CD presents works for guitar and chamber orchestra by two generations of Baltic composers. For Arvo Pärt, Osvaldas Balakauskas and Anatolius ¦enderovas, the system of the Soviet Union continued to form a pole of the aesthetic-political debate, although the cultural peculiarities and musical tradition of the Baltic States equally formed an orientation point, as well as the reception of Western influences (Serialism, Minimalism, Jazz) with a nod to the Polish avant-garde. The individual temperaments of the music by Pärt, Balakauskas and ¦enderovas speak for themselves, whereby the contrast between the mystical approach of Pärt and the lucidity of Balakauskas’ approach is particularly marked. In the meantime, a younger generation has emerged, which is represented here by Tonu Korvits and Eriks E¨envalds. Their music is pervaded with traces of “couleur locale” Baltic music, which is evident in the modal harmonies and references to folklore, and which, on the one hand, they continue to develop. On the other hand, there is evidence of a penetration of influences that indicates contact with the range and variety of contemporary music styles. With this CD, Reinbert Evers, Robert Aitken, Donatas Katkus and the St. Christopher Chamber Orchestra of Vilnius continue their successful cooperation, and, in addition, contribute to highlighting the diversity of music in all regions of Europe.